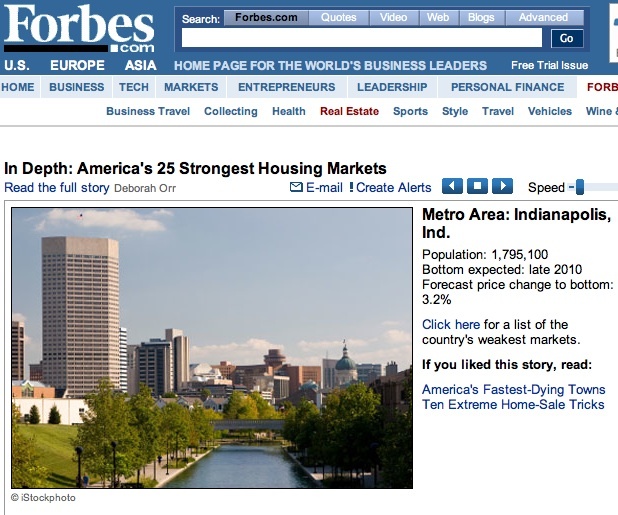 Forbes Magazine recently named the Indianapolis Metropoloitan area as one of the 25 strongest housing markets in the country. To compile this list, we asked Moody's Economy.com to compile a list of the country's real estate markets that are nearest to recovery. Moody's looked at the country's Census-defined metro areas--including metropolitan and micropolitan statistical areas--with populations over 500,000, and prepared forecasts through 2011. They then compared them to prices in the second quarter of 2008, which are the latest figures available, to calculate how far prices will likely fall before reaching bottom. This is fantastic for the area and a welcome piece of good news in time of generally not so good news. These types of accolades reaffirm what those of us who live and work in the Indianapolis metropolitan area already know: we live in a great city!